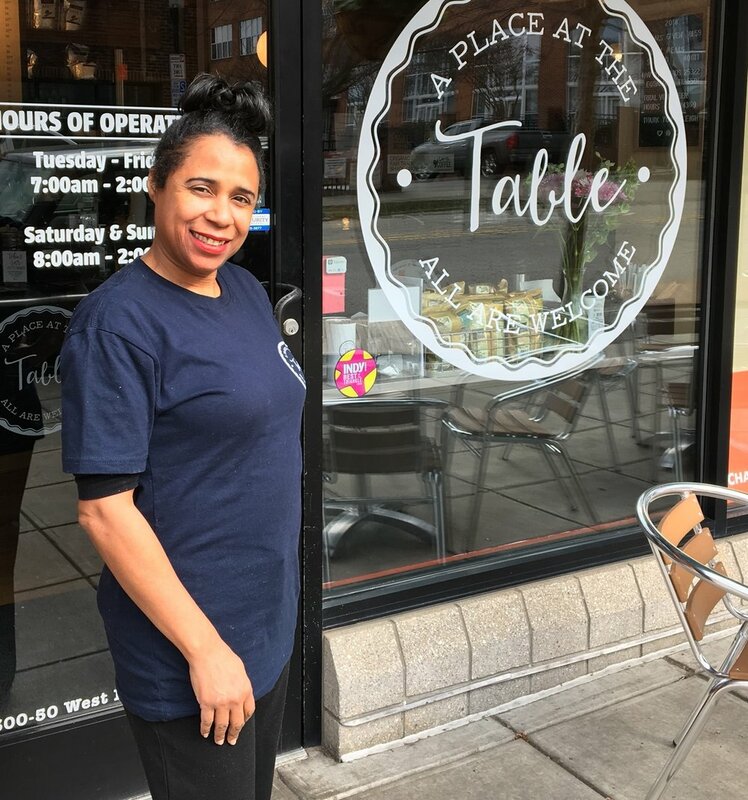 Maggie Kane is the Founder and Executive Director of A Place at the Table, the first pay-what-you-can cafe in downtown Raleigh. She graduated from North Carolina State University in 2013 and began working for a nonprofit with people experiencing homelessness. By befriending many people living on the margins, she knew something needed to be done. Maggie has a heart to serve, a desire to always be inclusive, and a passion for loving people. Through her work with people on the streets, she realized the power of community, the importance of dignity, and the beauty in bringing people together over incredible food. February 2015, A Place at the Table was birthed and Maggie never looked back. A Place at the Table opened in January of 2018 serving thousands of people in Raleigh with a dignified, healthy, and affordable meal. However, more importantly, a meal that feeds more than just the stomach-- it feeds your hearts, souls, and minds. Outside of the cafe, you will catch her running marathons and eating peanut butter! But...you will mainly find her at the cafe right now loving on people all day. Josh Hancock is the Cafe Manager. He grew up in Auckland, New Zealand before embarking on a series of travelling adventures that took him to many exciting places around the world, eventually leading him to Raleigh, NC. Josh graduated from Victoria University in Melbourne, Australia with a Bachelor of Arts in Sociology and History, and also holds a Graduate Diploma in Social Policy from Massey University in Auckland, New Zealand. He has an extensive background in the hospitality industry and has most recently been working at Buku in downtown Raleigh. Josh loves to go surfing whenever he gets the chance, and also enjoys playing golf and cooking. Usha was born in a small mountain town Livingston, Montana. She moved to Raleigh with her family and has since enjoyed hiking, biking, and being outside here! She loves hot yoga and COFFEE. Her coffee drink of choice is a good cup of black coffee, but if it is cold out you may see her drinking a peppermint soy mocha during winter. Not only does she love working for A Place at the Table, but she enjoys working with the Larry's Coffee team helping with events and all things coffee! Andrew is the Executive Chef. He grew up in Vicksburg, Mississippi and was raised on the delicacies of the Mississippi delta. Helping Momma in the kitchen, he learned that serving others first was top priority. Andrew received a degree in Pschology from Louisiana State University in Baton Rouge. While in college, he worked in kitchens and was fascinated by Cajun and Creole cuisine. Learning as much as he could along the way, he began his career as a chef. Being the chef of A Place at the Table, is a dream come true for Andrew. Andrew enjoys being outdoors with his fiancée and four dogs. They love to go hiking and canoeing, while at home Andrew is found working in his garden or woodworking. Aaron was born in Rose Hill, a quaint agricultural town in eastern North Carolina. He graduated from the Duplin Early College High School with an Associates of Interdisciplinary Studies and plans to complete an Undergraduate Degree in Math. He moved to Raleigh in 2014 shortly after graduating where he has and continues to build a strong background in sales and the service industry. Growing up in Rose Hill, community and food are a foundation of who he is. He has a passion for food, flavors, and presentation and you can currently find him here or tending bar at soca in Cameron Village. In his free time he is typically reading or cooking for his friends. Evan is a Barista at A Place at the Table. He was born in the suburbs of Southern California and raised in Cary, North Carolina, Evan spent his formative years nurturing an appetite for music and art. He attended the Musician’s Institute in Los Angeles, where he earned an associate of arts degree in Audio Engineering. After graduating, Evan spent time touring as a musician and working in the hospitality industry around Raleigh. The experience of traveling the world, sharing his music and forming bonds with people in different countries and cultures produced in him a love for people and for serving. Evan believes that relationships are the most important thing we do. He is passionate about creating music and communicating with people in meaningful ways. In his free time, you can find Evan writing music, reading, or looking at dogs on the internet. Alyson grew up in rural Kansas and later graduated from the University of Kansas with a Bachelors in English. She discovered cooking while working at a Jamaican cafe during college serving up rice and peas. Since graduating, she’s moved around the country honing her culinary skills. Having most recently lived on the west coast, Alyson is excited to learn all about the South and to be a part of A Place at the Table. Karma was born in Milwaukee, Wisconsin, but she was raised in Birmingham, Alabama.. (A Southern Diva & A Roll Tide Fan...!!!) Karma fell in love with cooking and helping her grandmother in the kitchen cooking flavorful Southern Cuisines and baking Amazing Cakes which she sold to her neighborhood friends. Karma is also an Army Veteran that served in the Gulf War whose job included refueling helicopters. She also previously worked in the Corporate World in Administration and Accounting while raising her two kids, Tony & Angel who are currently in college. Karma left the desk and computers behind to pursue her dreams of working in the culinary world. She started working at the cafe as an apprentice through Passage Home culinary program and joined the A Place at The Table team after! Karma is very excited to start off her culinary dream working at A Place At The Table with its amazing concept!